Sources differ on details of Bridgetower’s life. His birth date is variously given as 1778, 1779, or 1780, most likely February 29, 1780. It is known his mother was a Polish European, his father was of African ancestry, and he was born in Poland. While there are several versions of where his father came from – from Africa, or from Barbados – it is unquestioned that he was of African descent. During Bridgetower’s early childhood, his father was said to have worked in the household of Prince Esterhazy of Hungary, in a castle which maintained an opera house, a private orchestra, and employed the composer Franz Joseph Haydn. The Prince was a great patron of the musical arts, and this childhood home would have been an ideal incubator for Bridgetower’s extraordinary talents. He was elected to the Royal Society of Musicians in 1807. 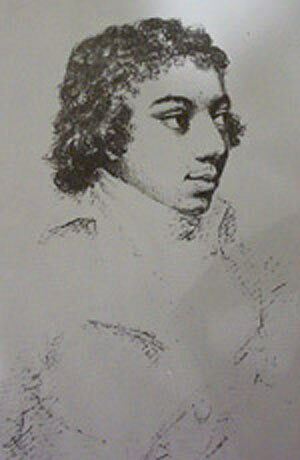 In 1811, Bridgetower earned the degree of Bachelor of Music at Cambridge University, where he also did some composing. He taught piano, and continued to perform and travel, especially to Italy. Little is known of his later years, and he died on February 29, 1860 in London. George Bridgetower is buried in Kensai Green Cemetery, London. A portrait of Bridgetower is in the collection of the British Museum. Percy A. Scholes, The Oxford Companion to Music, tenth edition edited by John Owen Ward (London: Oxford University Press, 1970); www.black-history.org.uk/prodigy.asp ; www.100greatblackbritons.com/bios/george_bridgetower.html; www.bl.uk/onlinegallery/features/blackeuro/bridgetowerbackground.html.